Mmm… Smoothies and muffins for breakfast. …yes, I finally got a food processor. Luxury! Proper post may be up later. Sorry about the lack of images – we’re having server problems over here. Today I left work earlier and was able to spend time on cooking! Yay! Finally! I shouldn’t be so irrationally giddy about this, I’m sure… but who could resist when the end product looks like this? 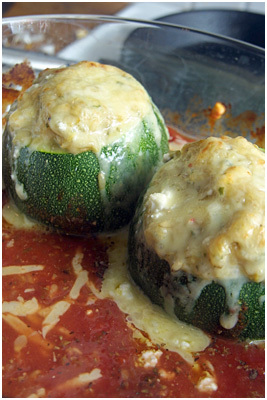 Stuffed zucchini have a reputation for being the “Help, it’s harvest time and my garden is full of giant zucchini!” food. But they’re so delicious! I don’t have a garden but when I am offered a huge, gardenfresh zucchini I never say no. 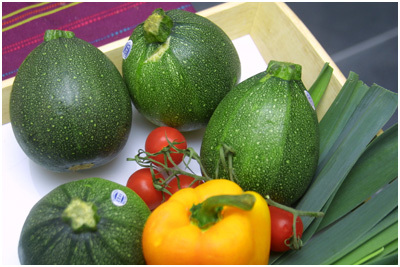 And those ball-shaped zucchini from the organic supermarket were just too cute to resist! 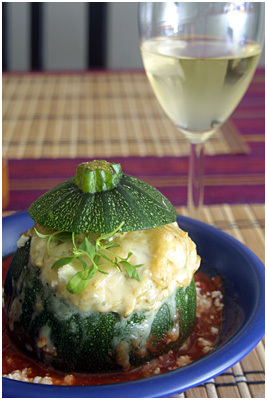 The recipe tonight is for a healthy vegetarian stuffing with brown rice risotto, the zucchini scrapes and feta cheese. I have before made a pescetarian variant mixing in a can of tuna with the rice, and of course if you’re a meateater nothing keeps you from adding ground meat either. 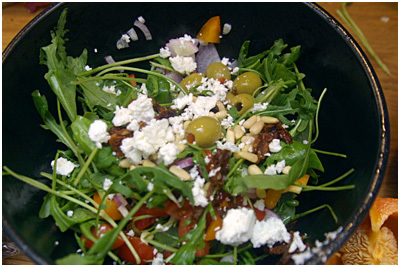 But the feta cheese tastes incredibly fresh and lovely! I recommend trying it. 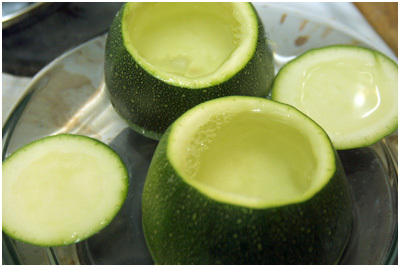 First, the zucchini are hollowed out. I always just use a spoon with sharp edges for it and scrape out the flesh. Keep the scrapes – we’re going to use them right away! Since I was hungry and didn’t feel like waiting later on, I poured some boiling saltwater in and around the zucchini and let them soak for about 5 minutes so the shells would be pre-cooked. 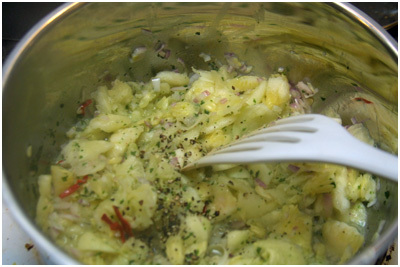 Then I chopped a red onion, some garlic, chili and parsley (psst: I cheated and used frozen pre-chopped parsley) and fried it with salt and pepper in some butter and olive oil. I had decided to vary my recipe a little today and make a risotto instead of mixing the ingredients with precooked rice. That way, I also get to demonstrate my risotto-cooking strategy. 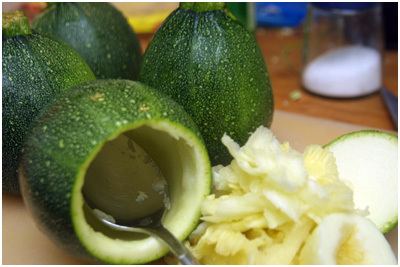 If you like your vegetables a little more al dente though, use the mixing strategy as the boiling time of the risotto will certainly mush the zucchini. 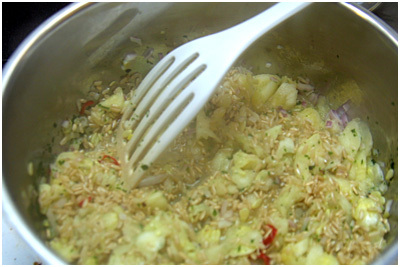 When the onions are glassy, add the rice (this is about 1 cup – enough to fill both zucchini in the end) and fry a little more so the rice becomes slightly translucent. I used brown rice though, which won’t become translucent, just covered in oil :) Then add vegetable broth. Add just enough broth to cover the rice, put on the lid and let it boil on medium heat. 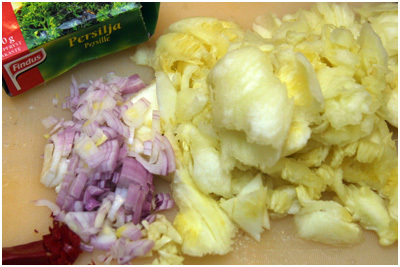 Add little amounts of broth until the rice is cooked through. Try to avoid stirring too much. 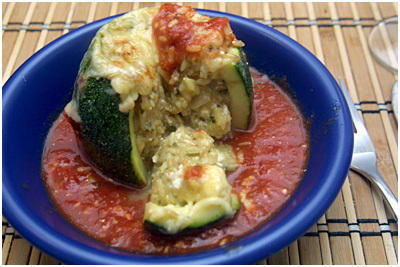 I crumbled a little less than a packet of Feta here, using just a fork and making irregularly-sized crumbles and chunks that are big enough to stay in one piece when stuffing the zucchini. 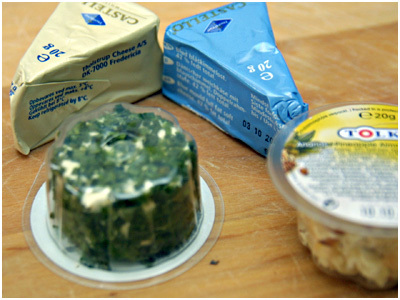 There is also yellow cheese (e.g. 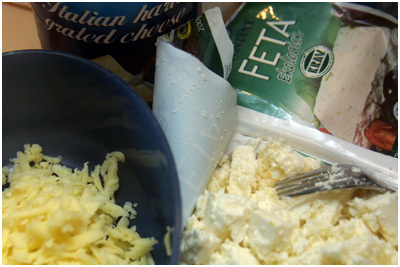 Mozarella or baking cheese) and parmesan for gratinating (or “cheese crusting”!). 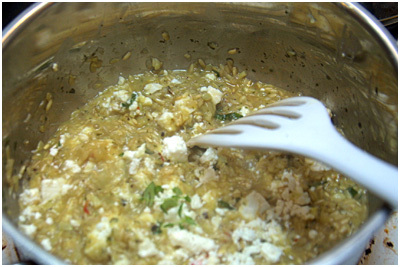 The feta gets mixed in with the risotto when it is done. 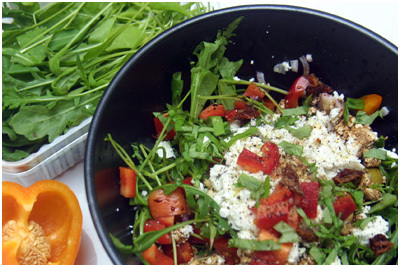 I also added a few last-minute fresh herbs – thyme and basil – because those taste best if they haven’t been cooked a lot before being eaten. 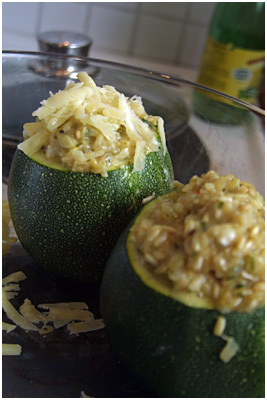 Then the mixture is filled into the zucchini cups, and the yellow cheese is sprinkled on top. Add a little crushed tomatoes spiced up with french herbs around it (if I had found a smaller pan I could’ve filled it up to the top) and off in the oven they go for some baking! And here they are baked. PS: I bought four? The other two are going to be experimented with soon. I heard Quinoa or couscous stuffing is especially good! 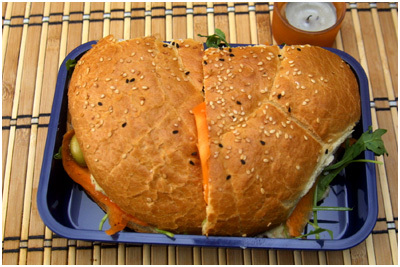 I guess the reason I’m not numbering this one is this: I don’t see a box stuffed with a sandwich as a bento. Why not? 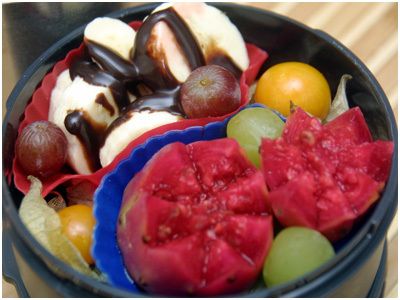 There are bentos containing sandwiches and all kinds of non-traditional Japanese food. 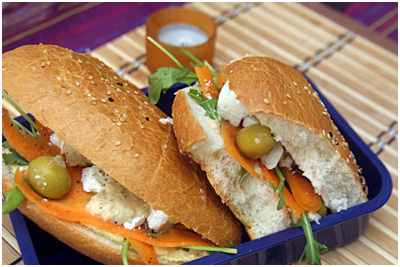 The sandwiches are also no less fancy – not your vanilla pb&j here. But there are two things that make a bento a bento for me, I think. One, the box should have more than one food. 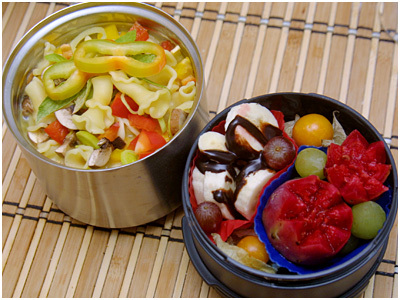 Having different dishes, or differently prepared food in a box is something essential to bento for me. Boring! 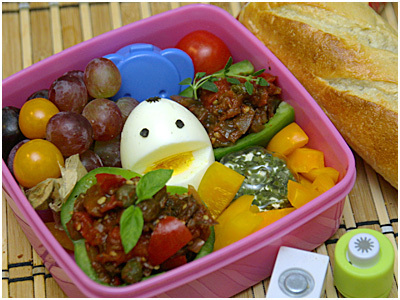 And definitely not the same as an elaborate bentobox. But they were still delicious. 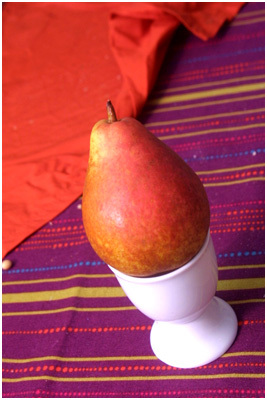 Pears are worth a post too. The good fruit fairy, who has in late summer put bags of freshly-ripened apples next to our mailbox, has returned – only this time the bag was full of pears! I am somewhat ashamed of my childish squee over them. I guess while I never regarded them as something special they somehow are – rarer than apples, and even though I have weighed the thought of buying some in the supermarket for the last few weeks, I somehow haven’t managed to. Those pears are delicious. Like the apples, they seem to be of the gardengrown variety – small and with a lot of taste, little sugar. The peel is thick, almost leathery. I can pull half a millimeter of it off the soft flesh with mt fingers. The flesh itself is bright white, dripping juicy and soft with ripeness – supermarket pears are hard and crunchy, not properly soft at all! It crumbles and melts on my tongue as the juice runs down my chin (I feel sloppy, but that’s part of the experience, much as with nectarines and melons). When I lived on campus, one of my neighbours got goosebumps from the texture of pear flesh on her tongue. She couldn’t explain why – it was just a funny neural connection. 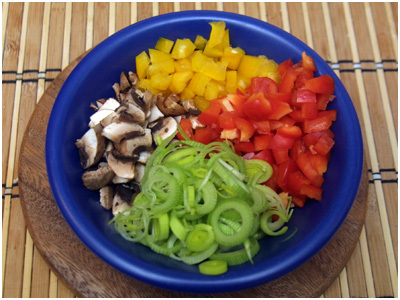 A breakfast/snack box – since I have started training Aikido I actually start feeling hungry in the morning! And since I should go in early tomorrow to get as much work done as possible while the sun is still up, I thought I’d better get something to start me of well and soften the hunger should my lunch and/or dinner be late. It’s crunch time at the codemonkey farm! The bread is extra so it doesn’t get soggy. It’s a ready-baked baguette roll from the freezer. Pumpkin soup with bell-shaped pasta and vegetable “croutons” in the thermos container; mixed fruit in silicone muffin cups (for easier removal because I’ll use the container as soup bowl) in the bowl container. Part 1 of my bento includes pumpkin soup that I had frozen last time I made soup and rewarmed for dinner. 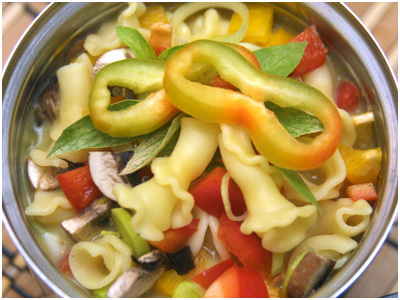 It’s poured over bell-shaped pasta and veggie croutons, and decorated with some pasta, thai basil and bicolored bellpepper. Part 2 has me buying some unknown fruit in a frenzy of curiosity and immediately rueing it – I should have listened to great teacher Baloo! Try to use the claw! Why oh why didn’t I listen to Baloo, I exclaimed as I set forth with a sterilized needle and tweezers to remove thousands of tiny, invisible pricks from my palms after cutting unknown fruit – which I should have been careful of since the packet did say cactus pear! The fruit itself is fun though – the flesh tastes like a mixture of banana and orange, maybe with some apple in it. It has a lot of small, hard seeds in it which make me wonder how to properly eat it though – they get in the way! Pulp it through a sieve? Spit cores like when eating a watermelon? I have 5 more! Heeelp!